After accordionist Mark Greathouse met a Prague singer/dancer named Helena while studying in Europe, the two became a musical duo now known as “The Greathouse of Music.” Based in Portland, Oregon, the duo has now produced a book presenting a series of dances with musical accompaniment. 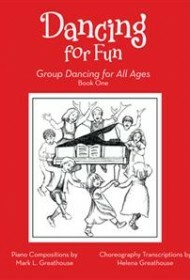 This first of two volumes of Dancing For Fun features descriptions of 12 dances, each of which requires no more than a couple of minutes to perform. Along with descriptions of the moves needed to perform each dance, the authors have included a piano score of the musical accompaniment. The piano parts should be easy to read for an intermediate-level pianist. Much of the music has a delightful, mid-19th century, Central European feel. The dances are intended to be performed by groups of all ages and are kept simple enough to achieve this aim. They have evocative titles such as “Spring Rain” and “Awakening.” The choreography for each dance is presented in simple written instructions, such as “Turn 90 degrees to left.” These written instructions would require some study to perform, but the authors have aided their readers greatly by creating videos available on YouTube for each dance. The YouTube videos show the dances performed by a single dancer, which allows an individual to learn the moves easily. The book’s appendix attempts to give links to the YouTube video for each dance, but the spelling of these links is incredibly unwieldy for example: “http://youtu.be/A87PJ3ofKpl?list=PLMXzOm_ewb6lpLvdPcbiGTP-dxottjGIJ.” Since the authors’ website has clearly marked links to the YouTube videos, it might be better simply to refer readers to their webpage as they do on page 3, rather than expecting readers to type in such complex URLs. The book comes equipped with a helpful glossary of dance-related terms. Overall, it provides an accessible introduction to the art of dance that should particularly appeal to beginners.